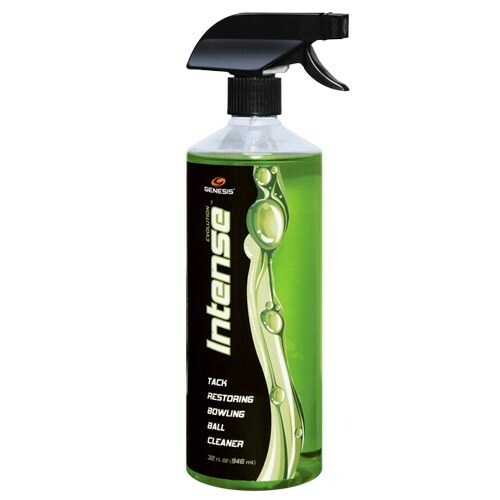 Genesis Evolution Intense Green 32 oz. Genesis Evolution Maxx Orange 32 oz. This is no one trick pony. It's an intense one-two punch that will clean your ball and give it a performance "kick" you never knew it had. The advanced water based, tack restoring formula of Evolution IntenseTM will easily break down dirt and oils, lifting them away with a slight foaming action. While this is going on, the special tack agents begin to work their magic on the coverstock surface, giving you a clean, fresh & tacky surface that's ready to grip the lane. One use, and your ball will provide a more intense reaction. Due to the time it takes to produce the Genesis Evolution Intense Green 32 oz. ball it will ship in immediately. We cannot ship this ball outside the United States.